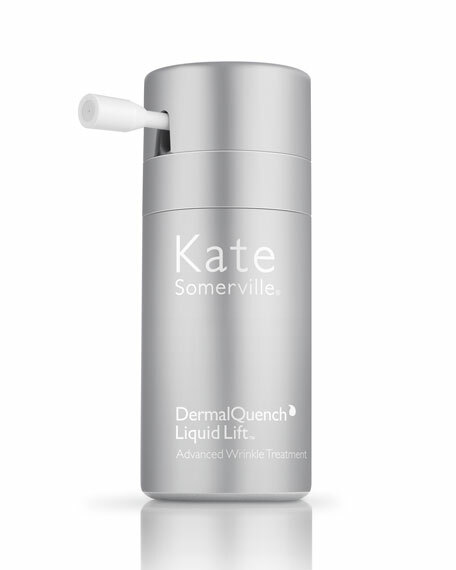 Bring home the most sought-after Kate Somerville Clinic treatment! A scientific breakthrough, the patent-pending delivery system of DermalQuench Liquid Lift Advanced Wrinkle Treatment with HydraFill Complex produces immediate and long-term results. The advanced formula aggressively combats wrinkles, sagging skin, uneven tone, and dryness. See the immediate and long-term effects of deep hydration, such as: an immediate glow, softer skin, and sustained moisturization. AM and PM. Use twice a day. Wash face and pat dry. Shake the bottle very well at least 10 times. Prior to use, prime the applicator by spraying 3 times, away from the face. Hold the applicator 1/2" from right side of face. Press the actuator button and dispense 2 to 3 horizontal stripes on the right side of the face (cheekbone, mouth to ear, and/or jaw line) and immediately massage in. (Note: Avoid contact with the eyes and lips.) Repeat stripes on the left side and massage in. Dispense 1 horizontal stripe across the forehead and massage in. Allow product to absorb into skin. Follow with a moisturizer and/or serum. This product may cause the skin to tingle and flush slightly for a short time. If discomfort occurs, avoid spraying directly on face. Instead, dispense product onto fingertips and massage gently onto face and forehead using your fingers. Mild skin irritation may occur in some users. If irritation occurs, reduce frequency of application to once a day, or once every other day. If irritation becomes severe, discontinue use and consult a doctor.